France international Bacary Sagna is cautious of the quality in the Nigeria squad ahead of Monday's 2014 Fifa World Cup round of 16 clash. Estádio Nacional de Brasilia will host the game between both sides as they will be hoping to secure a place in the quarter final. 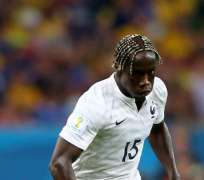 According to Sagna, Stephen Keshi's men will pose a lot of problems but insists Didier Deschamps' men will remain focused to triumph. “They will fight and they have a lot of qualities. But we want to concentrate on ourselves. As players, we aspire to go as far as possible, to win trophies. The former Arsenal player also revealed Les Bleus' aspiration of winning the trophy at the end of the tournament.